I want to thank Zard for all their great songs. It's simply amazing how many good songs they have produced. Most of their songs have such a fantastic music that keeps me wanting to hear them over and over again. There just wouldn't be a day without me hearing at least one Zard song. I hope Zard will keep producing songs, so that we Zard fans can enjoy their music for as long as possible. And my biggest wish is to ever attend a Zard concert. I know the chance would be very small, but it would be fantastic. The first Zard's song I've heard is the Slam Dunk ending theme song : "My Friend", 5 years ago...At this period, I listened essentially anime song. 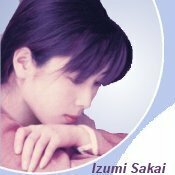 Listening for the first time Izumi Sakai's voice was very special, she has a very beautiful voice and compose excellent song. Now I've listened all of Zard's album and I listen a Zard's song everyday on my minidisc walkman. Zard is really and simply the best!!!!!!!!!!!! I bought my first Zard the album "Oh My Love" after reading some of the translated lyrics, which I thought was very neat. As it turns out, I really like their music as well. And there's no stopping me from getting Zard albums ever since. Some of my fav. songs are : "Today is Another Day", "Kimi ga Ita Kara", "Kitto Wasurenai," 'I Still Remember..."
Hopefully one day I would get to meet Zard members in person and thank them for making traffic jams bearable (to me at least! ).